The US housing's bubble and its spectacular end left a indelible mark on people's view of residential property markets. Sadly the idea of a "permanent" US housing market decline has been drummed into the heads of numerous, often well educated and otherwise open-minded people. Hoards of angry bloggers keep spewing the same line over and over again - housing prices will fall "forever" because of the shadow inventory, etc., etc. People, including many in academia, would deny a housing market improvement even if it stared them in the face. Positive housing news cause many to experience what psychologists call "cognitive dissonance", as they desperately attempt to rationalize away the data that doesn't conform to their views. The housing market bottom has to come some time, and as predicted at the beginning of the year (which really angered some of the folks described above), 2012 seems to be that year. Nobody is talking about a recovery of prices to the bubble years or even a robust growth in housing. We all know the issues. But on average across the US, home price declines have stopped. Multiple data points are now suggesting that is indeed the case. 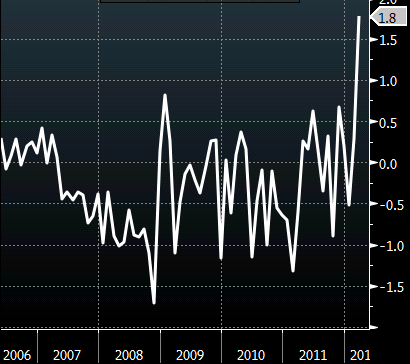 A sudden spike in the FHFA housing price index is one of those points. 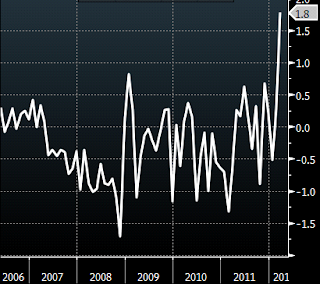 A 1.8% monthly increase in March is the largest monthly move in recent years. 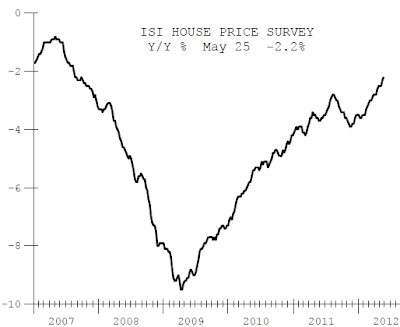 Our friends at ISI Group are continuing to see more recent improvements in April and May in their house price survey. That is in spite of otherwise jittery economic conditions in the US and the mess in Europe. Of course year over year the index is still down - we are not expecting any miracles here. But on a month-over month basis, the trend is unmistakable. This and other housing indices will be up from current levels this time next year. 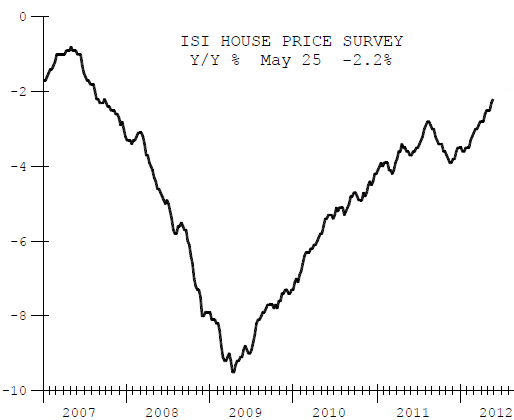 ISI Group: - House prices are continuing to improve in may. ISI's house price survey, which covers over 40 residential real estate agents around the country, continued to improve this week, suggesting existing house prices, which surged in April, improved further in May. There are other indicators pointing to improvements, such as the stabilization in lumber prices in spite of the recent sharp drop in commodity prices. Perhaps the best data point would be to hear it from the people on the ground - the realtors. The National Association of Realtors maintains a tremendous database and has done a thorough job in monitoring the health of the housing market. Their latest results indicate that distressed sales are beginning to taper off, the number of first time buyers is increasing, and prices are stabilizing.